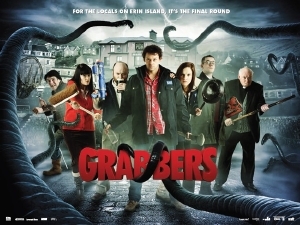 Jon Wright's much anticipated UK horror comedy Grabbers, is premiering at Sundance this week and a clip has surfaced (get it? That's the spirit!). In brief, it's the tale of ravenous sea monsters that can't handle their liquor. Something sinister has come to the shores of Erin Island, unbeknownst to the quaint population of this sleepy fishing village resting somewhere off Ireland's coast. First, some fishermen go missing. Then there is the rash of whale carcasses suddenly washing up on the beach. When the murders start, it's up to two mismatched cops--an irresponsible alcoholic and his new partner, a by-the-book woman from the mainland--to protect the townsfolk from the giant, bloodsucking, tentacled aliens that prey upon them. Their only weapon, they discover, is booze. If they want to survive the creatures' onslaught, everyone will have to get very, very drunk! Director Jon Wright's whimsical throwback to classic monster flicks relishes in delivering perfectly timed thrills and madcap antics. In true cult fashion, Grabbers imparts the great fun of a spooky old carnival ride with an Irish twist. Don't forget to grab a drink! So excited to see this on Wed!